Back cover blurb: Nothing has felt right since Elle rented out her house ... I’M IN YOUR HOUSE. There’s a new coldness. A shift in the atmosphere. The prickling feeling that someone is watching her every move from the shadows. I’M IN YOUR HEAD. Maybe it’s all in Elle’s mind? She’s a writer – her imagination, after all, is her strength. And yet every threat seems personal. As if someone has discovered the secrets that keep her awake at night. AND NOW I KNOW YOUR SECRET. As fear and paranoia close in, Elle’s own home becomes a prison. 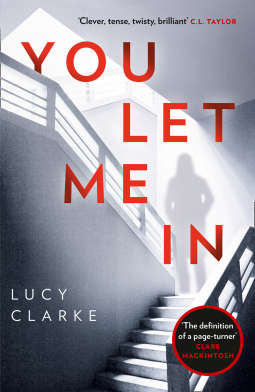 Someone is unlocking her past – and she’s given them the key… Spine-tingling, chilling, and utterly compulsive, YOU LET ME IN is the stunning new novel from Richard & Judy Book Club author, Lucy Clarke. Elle Fielding is a celebrated author on a tight deadline for her second (and eagerly anticipated) novel when she finally moves in to her Cornish retreat. The house she has always dreamed of. Except it’s not anymore. Not really. Because it’s the house she and her husband created together and now he’s gone. Recently out of the country on a writing retreat she reluctantly rented the house to an Air BnB user. Now the house doesn’t feel the same. Elle tells herself she is imagining things. But broken and missing possessions tell her otherwise. Elle has heard those words before, a long time ago. Hearing them again makes her feel like she is going mad. Her writers imagination working overtime. Her closest friends and family concerned for her welfare. But Elle knows that something just isn’t right. And the novel nearing its conclusion completely floored me with a subtle twist that I could’ve spotted, if only I’d looked a bit harder! You Let Me Lie is a fabulous novel and I can’t wait for this authors next offering. Let Me In is available now via Amazon online and all good book shops.